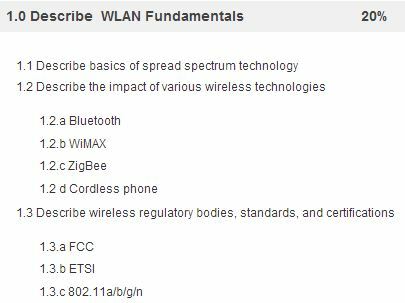 When I followed up on an interesting Learning New title on the Cisco Learning Network home page this morning, I immediately understood the lead-in “Exam Topics Provide More Clarity Now.” Cisco has revamped its detailed exam topic lists to include “weighted percents and additional subdomain detail.” In plain English, this means that Cisco is organizing and listing out its exam topics by domain areas in some detail, along with weights to indicate how much of total exam content and coverage is devoted to each domain. 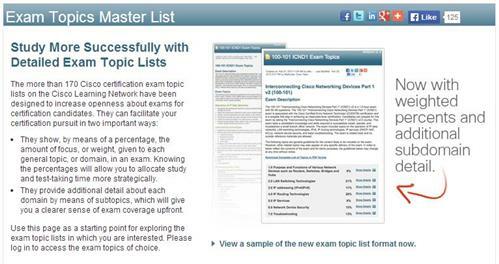 A blurb at the top of the Exam Topics Master List explains the newly-added information and details for all Cisco exam topic lists. (information showing is less than 50% of coverage for indicated subtopic). In general, I’m in favor of anything and everything an exam sponsor can do to shed more light on exam content and coverage. This not only helps candidates prepare for an exam, it also lets those who work with related platforms and technologies assess their exam readiness more directly, and guides them toward topics where they need to focus learning and preparation efforts.